Georgia Tech researchers found that microneedle-based patches delivered flu immunization to mice as effectively as hypodermic methods. Photo: GA Tech. A year ago, MPMN discussed research by the Georgia Institute of Technology (Georgia Tech; Atlanta) focused on the development of microneedles. 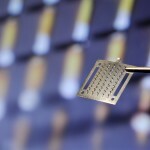 The school's scientists, in collaboration with Emory University (Atlanta), continue to pursue the exploration of microneedles as a less-painful and lower-cost drug-delivery method. Most recently, the researchers announced their findings that delivering a flu vaccine through microneedle-based skin patches proved to be just as effective in mice as delivery via intramuscular hypodermic immunization. Microneedles boast convenience, ease of use, and the ability to be mass produced in a relatively easy manner, in addition to efficacy and cost-effectiveness, according to the researchers. Because they are relatively pain-free, microneedles also are more patient friendly than conventional needles and could help improve compliance.